But when it comes to the navigation, the app suffers in a few ways. I've read (and heard) about some issues with the overall navigation model, that it's difficult to remember where you are and how to get back to where you were. I've experienced the same thing - but I'd like to focus on a few specific things I frequently use: a new option that allows a user to see only tracks downloaded to the phone, and general Music settings. The former is brilliantly highlighted by Jonny Evans in a recent article via Computer World. For the new option (accessible when My Music is selected), it's really hard to find. I access and change this setting a lot - I like to download tracks right to my phone so it's important to quickly and easily get to that setting to display only what's on my phone. Not only is it difficult to find (it's located under the list view switcher for Albums, Artists, Songs) - it can take a lot of time to get there. Since it's located at the top of each alphabetical list, if I'm in Artists, say around Slowdive or The Smiths, there's no quick way to get back up to the switcher - I have to scroll all the way to the top each time. Another music setting I change frequently is in the general Music settings on the phone - it's EQ between Rock (when i have buds in) and Off (in the car since I let my car's EQ settings take over). Currently it's just too many steps to leave Music, navigate to Settings, make the change, go back to Music, etc. each time. 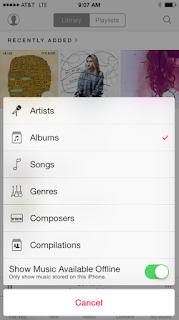 It's a lot of work not to mention it's separated from other music settings in the app like the one mentioned above and additional account settings located under the avatar icon. 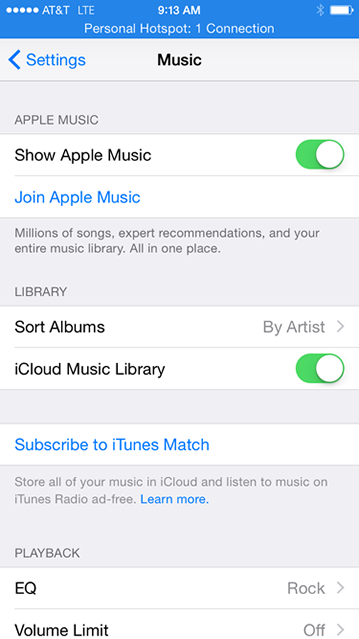 That said, it just makes sense to organize all of the music settings together in one easy-to-find place. Since Apple seems to be introducing more music options each release - I would recommend a Settings menu directly in the Music app. I would replace the avatar icon (top left) with a gear icon for settings, and combine the current Account options with other settings discussed above including all of the Music settings for the phone. It's basically about reorganizing things - a change like this would require small dev effort while benefitting the user in a big way, allowing him to predictably and easily get to these areas of the app.